Died: 2nd July 1917; age 24; Died of Wounds received in the field at the 91st Field Ambulance. Residence: 14, Permit Office Street, Ipswich. Employed: at Haddock and Baines – printers and bag makers, Lower Brook Street, Ipswich. Date of Entry Therein: 14th August 1914. 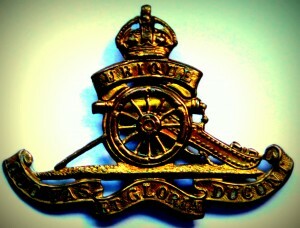 Regiment: Royal Field Artillery, 113th Battery, 25th Brigade. Medals Awarded: Victory, British War and 1914 Star + Clasp. Relatives Notified & Address: Son of Anthony & Carolina Motroni, of 14, Permit Office Street, Ipswich. Brother to PETER GEORGE MOTRONI & UMBERTO AMADEO MOTRONI. 1901 14, Union Street, Ipswich. John was 7 years old and living with his parents & siblings. Antonio Motroni, 34, Building – own account, born Italy. Carmela Motroni (nee Marcantonio), 34, born Atina, Italy. Rosa Lizzie Motroni, 8, born Colchester, Essex. Peter George D. Motroni, 5, born Colchester. Umberto Amedie Motroni, 3, born Ipswich. Angelina Motroni, 1, born Ipswich. John was 17 years old, a Soldier ranked Gunner in the 41st Battery of the Royal Field Artillery. John attended St. Pancras Roman Catholic School and St. Mary’s Convent School, Ipswich. In April 1910, John’s father, Antonio Motroni was admitted to a hospital in Essex. He died at the hospital in September 1911. Soldiers’ Effects to Carmela Motroni – mother. John is also remembered on St. Pancras Catholic Church Ipswich WW1 Memorial. 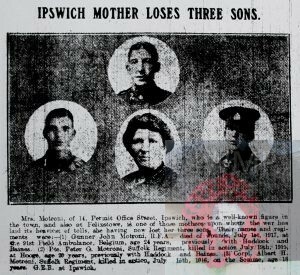 Mrs. Motroni, of 14, Permit Office Street, Ipswich, who is a well-known figure in the town, and at Felixstowe, is one of those mothers upon whom the war has laid its heaviest of tolls, she having now lost her three sons. 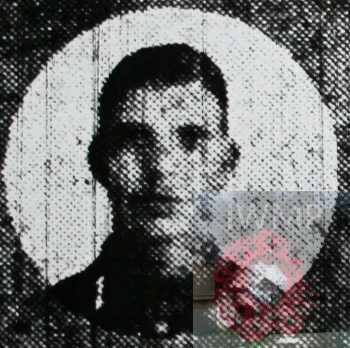 Their names and regiments were:-(1) Gunner John Motroni, R.F.A., died of wounds, July 1st, 1917, at the 91st Field Ambulance, Belgium, age 24 years, previously with Haddock and Baines. (2) Pte. Peter G. Motroni, Suffolk Regiment, killed in action July 19th, 1915, at Hooge, age 20 years, previously with Haddocks and Baines. (3) Corpl. Albert H. Motroni, Suffolk Regiment, killed in action, July 15th, 1916, on the Somme, age 18 years, previously with G.E.R. at Ipswich.